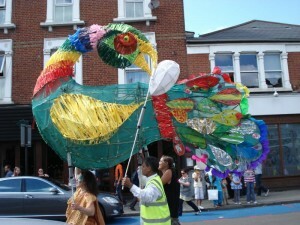 Here’s a press release from Transition Town Tooting about yesterday’s wonderful Trashcatchers’ Carnival…. Tooting Trashcatchers Carnival stops the traffic. Organisers of the carnival were jubilant that it had gone so smoothly and according to plan. Lucy Neal, Co Chair of Transition Town Tooting speaking this morning to ITV London Tonight news had this to say, “individually we may seem insignificant, but when we connect up in a community, we are very strong, we can make a huge difference. 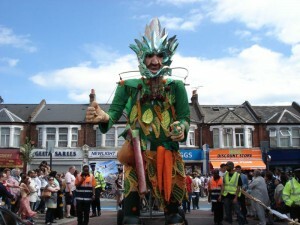 We are thrilled at how well it’s come together and amazed at the support we have received from the people of Tooting”. One of the more amusing floats we saw today were the cycle powered living rooms transporting some of the elders of the community. 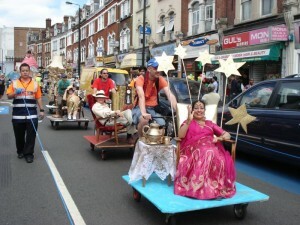 Sitting comfortably on her recycled armchair, Jaya Patel, born and bred Tooting resident said “ the best bit about this carnival is that its bought the whole community together from all sections young and old from all ethnic backgrounds”. The South London Swimming Club had a cycle-powered float with swimmers, iceberg and sea made entirely out of plastic bags and bottles. The swimmers themselves came dressed as the colourful doors of their changing rooms at the Tooting Lido. 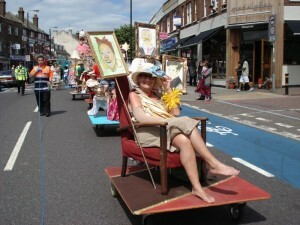 The Lady of Tooting, a 6 metre high animatronic creation told the story of Tooting on her crinoline Victorian dress decorated with over 170 faces of the ladies of Tooting. Antonia Field-Smith, a Tooting resident said “It was great to see Tooting High Street without traffic and to be able to walk down the road without worrying about getting run over. I loved it, what a fantastic event”.